Note: I am no longer playing Wildstar, and will not be updating this addon. As such, take this as a blanket statement that anyone may pick it up and update it to newer patches or whatever. A few days ago, one of my guildmates asked me if there were any addons about that he could use to display his nickname no matter what character he was on; since I didn't find one, I went about building it myself. This is the result. Custom wrap characters. You can either set a single character and it will display on both sides, or set individual wrap characters for each side. A simple slash command '/mn' that can be used to either open the options pane or alter the name that you have set. Per-channel options for customs and circle channels. I have an idea of how to do this, but it'll take some research on my part. Per-character options, as that kinda defeats the purpose of the addon; if you want the addon to be disabled on a specific character, Carbine's Addon interface has advanced options loading the addon. 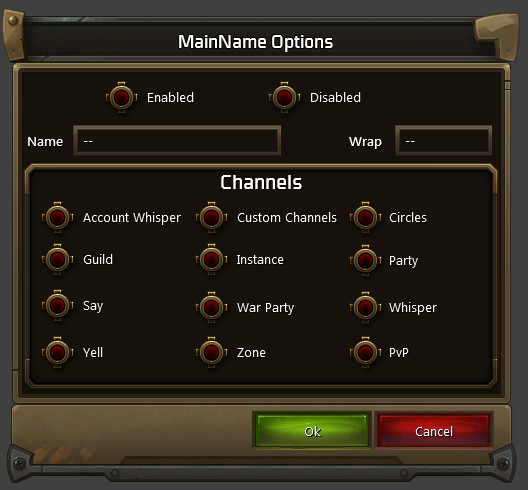 This addon replaces the "VerifyChannelVisibility" function from Carbine's ChatLog addon. As of July 11, MainName has compatibility layers for both Killroy and ImprovedChatLog, but I have not tested it with any other chat addons. Additionally, this is the first addon that I've ever created; as such, YMMV. For now, the addon starts disabled due to me not being able to reliably get the PC's name while loading in. Just use '/mn' in order to configure it. Any critique is welcome, as are bug reports both here and to Zhiustmor@Evindra.